Shri Dharmasthala Temple is one of the most visited temples of Karnataka. Located on the banks of Nethravathi River, in the village of Dharmasthala, in Belthangady Taluk of South Kanara Distict of Karnataka, and 62 kms east of Mangalore, Sri Dharmasthala temple is very popular among devotees. The main deity of this temple is Shri Manjunatha Swamy, a form of Lord Shiva. This temple attracts Jains, Hindus, Christians, Muslims to get rid of their various ailments. Dharmasthala is an outstanding example of religious tolerance, as it welcomes worshippers of all religions. The priests are Vaishnavite Brahmins and the guardian of the temple is Heggade, a Jain by faith – altogether forming a confluence of faiths that harmonize in belief of the Omnipotent. The other main deities in the inner circle of the main sanctum are Goddess Ammanavaru (Parvathi) and Lord Mahaganapathi. Other shrines near the main temple are Kalarahu, Kalarkai, Kumaraswamy, and Kanyakumari. Like other temples of India, photography is not allowed here inside the temple. a. Monolithic statue of Lord Bahubali on the Rathnagiri Hill near Dharmasthala. b. Manjusha Museum where beautifully crafted art work, metallic statues and paintings are displayed. c. Car Museum where rare vintage cars are exhibited. 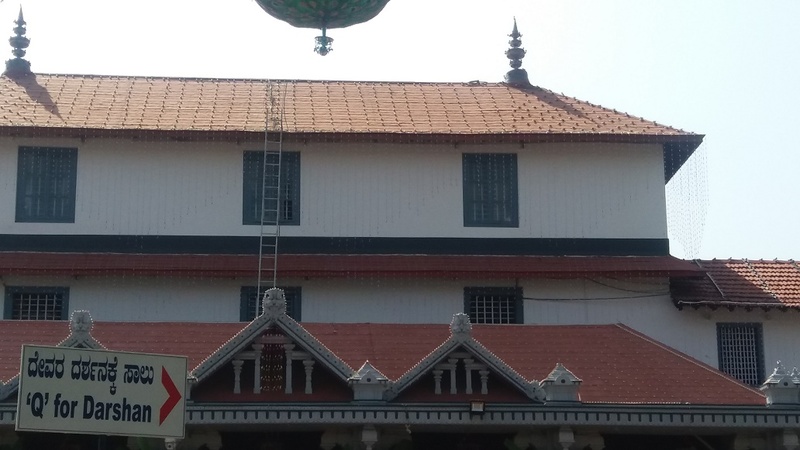 i. Udupi Sri Krishna Temple, Udupi. The pilgrims are offered free food and lodging. Dharmasthala kitchen is one of the best in the world, with newer technologies. Dharmasthala is also famous for its Chair of Justice. There are several guest houses available in Dharmasthala.